I've heard about this award before, but I never thought we would be nominated for it! 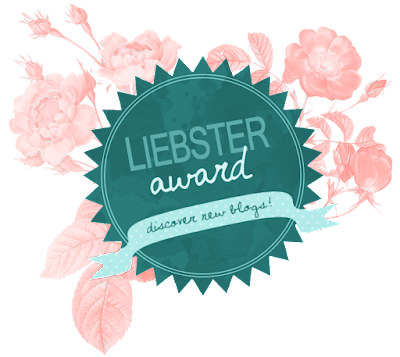 Nira from It'sNira recently nominated us for the Blogger Recognition award and she has now nominated us for the Liebster award too! Thank you so much to Nira; you all NEED to check out her blog! 1) I am a Libra. 3) I am short sighted. 5) My name (Aleeha) is actually Arabic. 6) My favourite popcorn flavour is sweet. 7) I did not want Britain to leave the EU. 9) My name is Aleeha... not HALE. 10) I love Muller Corner yogurts... especially the toffee hoops ones. 11) Global warming scares me. This is a hard one because I love so many, but it's probably 'If you're not doing what you love, you're wasting your time'. If you want read some more of my favourite quotes click here. 2) What is your favourite thing about your blog? My favourite thing about this blog is that I share it with one of my best friends! 3) If you could have any superpower, what would it be and why? I think it would be really cool to be able to rewind life. I wouldn't want to change things that have happened in my life, but I just think it would be nice to able to rewind and relive moments of your life! 4) Who is your favourite Disney princess? Rapunzel for sure! I absolutely love the movie 'Tangled'! 5) What is your favourite subject in school? 6) What is your favourite word and why, if you have a reason? I've always liked the word 'bubble'. It sounds really happy and energetic! 7) If you could buy any 3 things in the world, what would they be and why? 1) The best camera you can possibly get for taking blog photos because then I can put up really pretty photos on this blog. 2) A Jacuzzi/ hot tub because it would be so cool to have one of them in your house! 3) A rollerboard because who doesn't want one of them?! 8) What is the weirdest thing you have ever done/said? I don't know... I say a lot of weird things. The other day I was talking to my friend and she asked me what I had just ate and I was meant to say 'pizza, chips and crisps', but I remembered that I still needed to tell her that I'm getting my braces taken off soon, so I accidentally said 'pizzachipscrips' really fast and kind of blurred all the sounds together. 9) If you were the President or Queen, what would you do to make the world a better place? As I have mentioned, global warming really scares me so I would probably start to slowly reduce the amount of electricity being used in the country... somehow. Again.. I have a lot of favourite books, but I love All the Bright Places by Jennifer Niven and We Were Liars by E. Lockhart. The blogs listed above are absolutely incredible and I love reading the posts on there. Please check those blogs out as I am sure you will love them too. 1) Do you want any piercings? 2) What achievement are you most proud of? 3) Which famous person would you like to have dinner with? 4) If you could be best friends with a character from a film/book, who would you be best friends with? 5) Can you roll your tongue? 7) If you were stranded on a desert island, what 3 objects would you want to have? 8) What one piece of advice would you like to give to your younger self? 9) What/who inspired you to start a blog? 10) Have you ever considered quitting blogging? 11) What was your favourite TV show as a child? I'm looking forward to reading the answers to these questions! Treat it like a mini Q&A session!